When you ask people what to see or do in Norway, they answer, "see the coast". 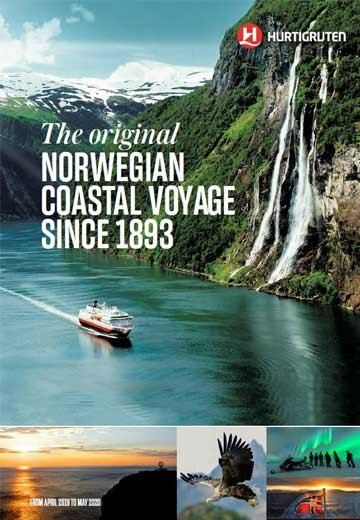 In this brochure, you can read why Hurtigruten is the only way to experience the Norwegian coast. The aurora is so frequent here that over 99% of our 12-day voyages last season recorded Northern Lights occurences. In fact, we're so confident the Northern Lights will appear with us on a 12-day voyage between October and March that we promise to give you another voyage if they don't. This promise is the closest anyone can get to a Northern Lights guarantee. We are also looking forward to the maiden voyage of MS Fridtjof Nansen, our second state-of-the-art, hybrid-powers expedition ship, revolutionising expedition travel for future generations to enjoy.